India and England cricket teams are regarded as the two superpower teams in the current World. Most of the time, India used to play at their home ground. But in recent time, they are traveling England where the ECB has arranged a dual tournament consists of two teams. The tournament started with T20I series where India won the series by 2 – 1. India won twice times and England won once. But England took revenge so quickly. India faced defeat in ODI competitions where England won twice and India won once there. Finally, they are now in the main schedule which is Test. They have recently finished the 2nd Test match where team England won 2nd Test against India. So, now they are now leading the series by 2 – 0 games so far. 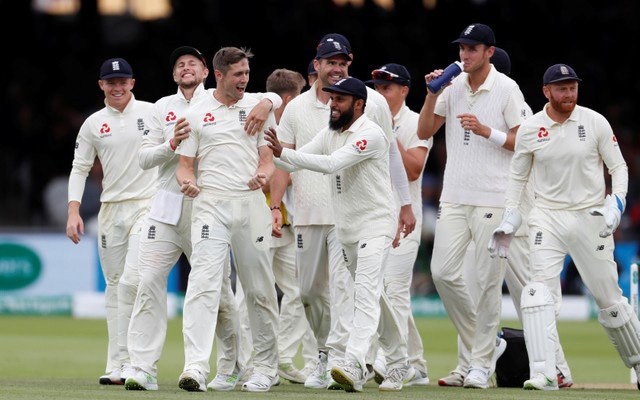 There are still three Test matches in hand and to win the series the local team England has to managed just one victory there. In 9th August, 2018 the 2nd Test match between India and England took place and this time the host venue was Lord’s in London. In the match, Ollie Pope made his Test debut with England. Team England won the toss and decided to bowl first. So, India came to bat for the first innings. Vijay and Rahul started the innings for India. In 0 runs opener Vijay was gone. When team India scored just 10 runs, 2nd wicket was gone as well. It seems that team India faced batting disaster in the first innings. Couple of players got few runs each where captain Kohli scored 23 runs, Rahane scored 18 runs, Pandya scored 11 runs and Ashwin scored highest 29 runs for the team India. In 35.2 overs team India lost all wickets and they scored 107 runs only in the first innings. Anderson took five wickets for England where Woakes took two wickets so far. The first innings of England was so impressive. Cook and Jennings started the innings. In 28 runs opener Jennings was gone. Just 4 runs later, Cook was gone as well. Captain Root scored 19 runs where Pope scored 28 runs for the team But Bairstow scored 93 runs and Buttler scored 24 runs. Woakes made a century and remained not out with 137 runs. Curran added 40 more runs. So, by making 396 runs by losing seven wickets team England declared their first innings. Shami and Pandya took three wickets each for India. India faced batting disaster in the 2nd innings as well. They scored total 130 runs and lost all wickets. So, they faced defeat by an innings and 159 runs so far.